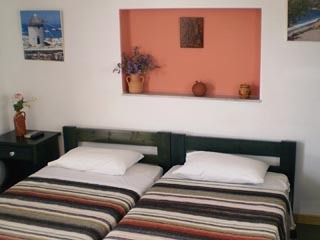 Margaritas studios offer self-catering accommodation in Parikia, the main port of Paros and in the countryside, another unit 4km from the center. 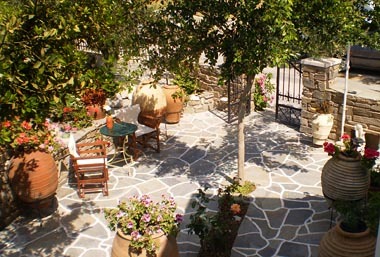 Margaritas in Town are shelled in a pretty Cycladic style house with a home-like feeling, surrounded by a traditional courtyard where an old vine tree offers you its shadow unsparingly. Margaritas Countryside studios are settled on a small hill with open views to the sea and the sunset, only a 3-minute drive from Agia Irini beach and Punda kite-surf beach. Margaritas Countryside studios are a kitesurfers favorite. 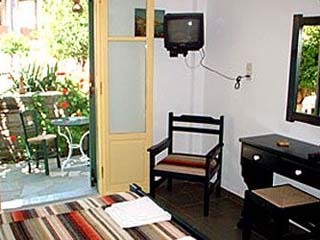 Margarita Studios in Town are located in the narrow, stone-paved streets of the old town of Parikia- a few minutes walk to the center. 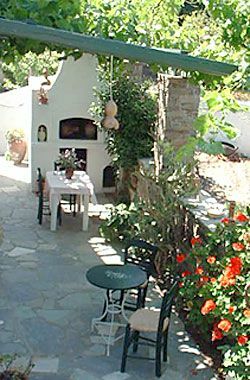 Mrs. Margarita�s family takes good care of the beautiful, green garden surrounding the studios, where you will find agreeable sitting corners, an original wood oven for your barbecues and an old vine crawling up the big pergola, covering a sitting spot. 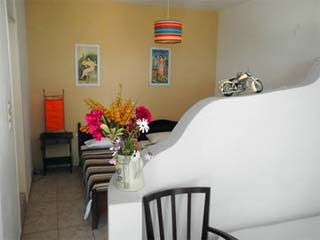 AtMargarita in Town you will find a touch of professionalism that you wont expect from other accommodations of this category. 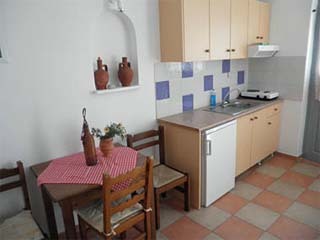 There are Studios for 1- 4 persons and a Family Apartment (with 2 bedrooms) up to 6 guests. 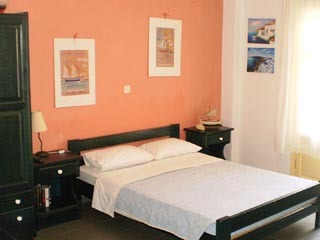 The rooms are spacious, offering kitchenette, TV and air-condition. They all open to the garden. Prices are reasonable and discounts often apply for long-term bookings. 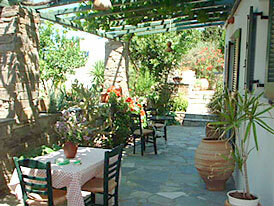 Margarita Countryside Studios have unobstructed views over the sea to Antiparos Island and the sunset. They are located at a 3-minute drive to the nearest beaches of Agia Irini and Punda (from where you can also take boats to Antiparos), and less than 10min. to the port. The nearby Punda Beach has also 2 kite-surf schools. The small accommodation complex is surrounded by a well-kept garden. 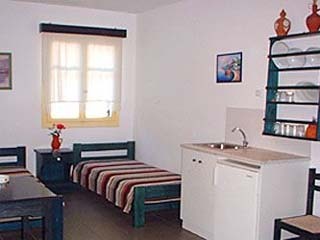 Here, there are studios for 2-4 persons, with a semi-separate bedroom (twin or double), a living space with 2 sofa/beds, kitchen and dining corner. Amenities include air-condition & TV, and there is also a shaded veranda opening to the garden where you can gaze at the sea and the colorful sunsets. Transport is provided from the port/airport upon arrival - own means of transport is necessary.